A good whole grain hot cereal is your breakfast friend. Over time, oatmeal and similar cereals can help reduce your cholesterol, reduce your risk for heart disease, help control your weight and offer many other significant health benefits. If oatmeal alone is a breakfast friend, a whole grain hot cereal that tastes great should be considered a breakfast super friend. I'd like you to meet some new Breakfast Super Friends. 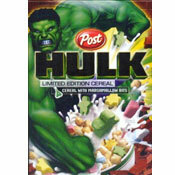 This cereal is from Brookfield Valley's All Natural Creations line. It has 0 Trans Fat and no hydrogenated oils. Each 1/2 cup serving offers up 6 grams of dietary fiber. It also tastes really good. The banana flavor is subtle but it makes enough of an impact to make a typically unexciting breakfast a little more interesting. The texture of the dried banana pieces in the prepared cereal feel like freshly chopped bananas. I'm not going to kid you. This cereal tastes and feels like a healthy cereal. It's not very sweet and fiber is clearly present in the texture. If you're looking for a hot cereal to ween you off of Cocoa Puffs and Fruity Pebbles, you're going to want to try a Quaker oatmeal packet. If you're someone who knows hot cereal and you're trying to eat healthy throughout the week, this Honey Banana Wheat Cereal is a good one to throw into the mix for some diversity. For the best results, I found the stove top directions worked best. The microwave method yielded a mushier product. I found myself adding 2 more Tablespoons of cereal and cooking 1 minute longer than the directions state to get an ideal texture. Be sure to let the cereal sit for 1 minute after cooking. That's when most of the thickening happens. I also found myself adding either a sprinkle of sugar, a teaspoon of honey or a small dollop of fat-free whipped cream to the cereal. Just a hint more sweetness helps the overall flavor. 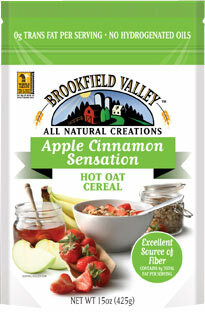 This cereal from Brookfield Valley is a little closer to packet oatmeal we're most familiar with. When I first opened the package, I was exited by the aroma of the dry product. It smelled like a homemade cookie. That sensation isn't as impressive to the taste-buds in the prepared cereal, but this cereal definitely has some high points. If prepared according to the directions (with one additional Tablespoon of milk), this cereal has a thick and creamy texture that many will find ideal. I also liked the apple pieces in this cereal - they're relatively large and there's lots of them. You won't need to add any additional cinnamon. There's a big cinnamon flavor in every bite. However, like their Honey Banana Wheat cereal, you may want to add just a hint of additional sugar or honey. Nutritionally speaking, this cereal is comparable to most other oatmeals. It has only 4 grams of total fat (compared to 4 or 4.5 grams in similar products). This cereal has 6 grams of dietary fiber and it's not uncommon for store-brand packet oatmeal to have as many as 7 grams dietary fiber. When it comes to oatmeal, nutrition comparisons are always very close. It's more a matter of finding flavors that will keep you coming back for more healthy oatmeal. If Apple Cinnamon Sensation sounds interesting to you as a flavor description, you should definitely try this product. 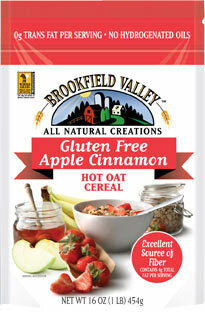 Brookfield Valley's gluten free apple cinnamon oatmeal is every bit as good as their Apple Cinnamon Sensation. In fact, I'm hard-pressed to find a difference between the two. If pressured, I'd say the gluten free product has a tinge more toasted oat flavor... which I prefer. The nutritional facts panel reads exactly the same for both products. The only difference in the ingredient listing is that this product has gluten free rolled oats as opposed to simply rolled oats in the other variety. What are gluten free oats? Basically, gluten free oats are purer, cleaner oats. The small amount of gluten found in standard oats is mostly from the oats coming into contact with wheat during growing, transport, storage and processing. Gluten free oats are grown and handled in a strict process to avoid contact with wheat. An oatmeal that tastes as good and is made from purer ingredients? I'll have some of that. I've talked with people on gluten free diets that have a hard time finding good breakfast items in the grocery store. If you're one of those people and you can find this product, definitely give it a try. And if you're not one of those people, you might want to try it too. It's basically just a good hot cereal. One note of concern: My only misgiving about these cereals is their sugar content. The two apple cinnamon cereals have 10 grams of sugar per serving and the banana wheat cereal has 16 grams of sugar per serving. Most packet oatmeals have less than 9 grams of sugar, with many of the simpler flavors having only 1 gram of sugar. Sadly, the sugar content does not equate to flavor in the Brookfield Valley products and, like me, you may find yourself adding even more sugar to your breakfast. If you're concerned about your morning sugar intake, you may want to compare other cereals down the isle. 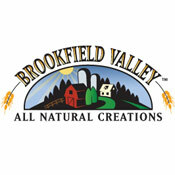 For more about these products and other varieties of hot cereal offered by Brookfield Valley, visit their official website. The $0.00 price shown below reflects that samples of the products were sent to MrBreakfast.com by the company. 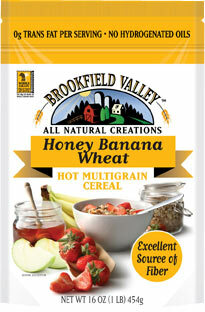 What do you think of Brookfield Valley Hot Cereals? I love this oatmeal! Just came upon it about two weeks ago and look forward to having some each day! Try adding dried cranberries instead of sugar or honey... they're just the right addition! I am trying to get their 800 number to order some. Could someone please post it. Gluten free OATS, YEAH, I have not eaten oats in 30 years, DELICIOUS!!!! Where can we get gluten free hot cereal. My gluten free husband loves it. We live in Hanover, Ma.